Obama's Day, May 10: Campaigning in Wash. and Calif. In the morning, the President will depart from the White House en route Seattle, Washington. The departure from the South Lawn and arrival at King County International Airport are open press. In Seattle, the President will deliver remarks at two campaign events. The first campaign event is print pool for remarks only and the second is pooled for TV and open to pre-credentialed still photographers and correspondents. 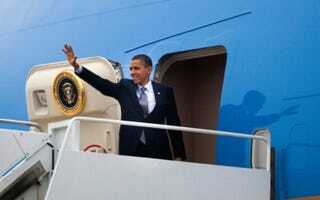 In the afternoon, the President will depart from Seattle, Washington en route Los Angeles, California. The departure from King County International Airport and arrival at Los Angeles International Airport are open press. In Studio City, the President will deliver remarks a campaign event. The campaign event will be print pool only for remarks only. The President will remain overnight in Los Angeles, California.